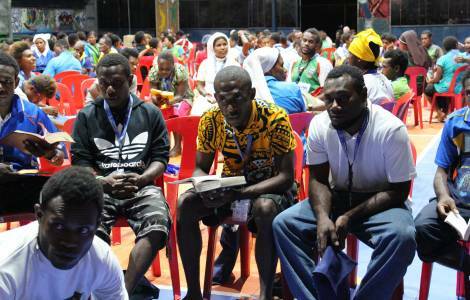 OCEANIA/PAPUA NEW GUINEA - Youth gathering, in communion with the Synod Assembly: "Christ at the center of life"
Kundiawa (Agenzia Fides) - The youth of the diocese of Kundiawa, a town of Papua New Guinea and the capital of the province of Chimbu, express their closeness and trust in the Pope and in the whole Assembly of Bishops that meets in October for the Synod dedicated to the young: in a large youth meeting, which saw the gathering of more than 1,500 young people from the diocese at the Don Bosco Technical College in Chimbu, those present brought the "Youth Cross" in procession, singing hymns and praises to the Savior, Jesus Christ, accompanied by dances, praying during the procession and publicly witnessing their faith. The theme of the meeting was "Youth of today, let us walk with Christ". The youth wanted to reiterate their faith in a special pilgrimage that brought the "Cross of the young" to visit all three parishes in Kundiawa. In the opening Mass, Fr. Edwin Genovia in his homily asked the youth to "give people and society Christian values" and "to be ambassadors of the love of Christ and of service to other young peers". The youth present participated actively in various activities of prayer, catechesis, discussion, liturgy, awareness meetings on social issues and the correct use of social media. Reiterating their desire to place "Christ at the center of their life", they expressed their closeness to the Holy Father and to the whole Assembly of Bishops who, gathered at the Synod in the Vatican, will reflect and allow themselves to be illuminated by the Holy Spirit on the life of young people in the Church. One of the youth coordinators and animators, James Bernard, told Fides: "Through this meeting, young people are invited to come out of their comfort zone, showing their talents, and together with Christ they will be able to contribute to developing our community, society, the province and the Country as a whole".